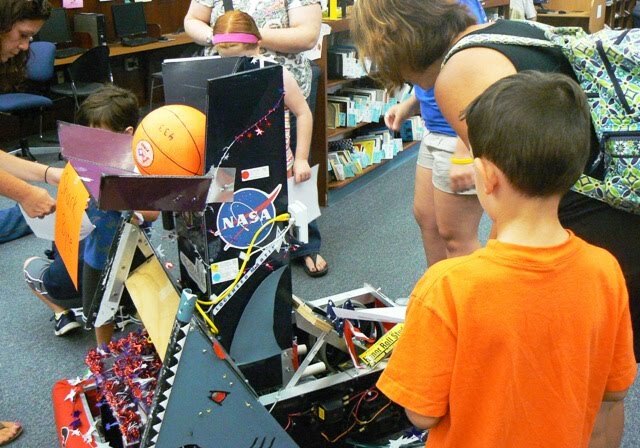 On July 10, the E=mCD’s robot Shark Byte joined robots from team 433, the Firebirds at the Springfield library for “Family Night : Robot Invasion”. There was a very large crowd of young children in attendance. 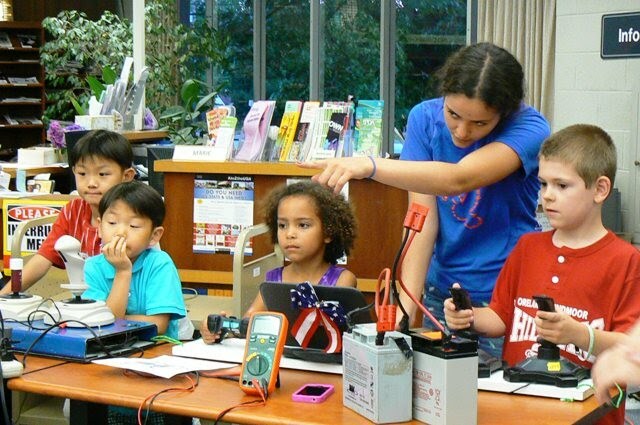 Our goal is to inspire interest is science and technology among kids and this turned out to be a great way to do it. The children began the evening with the Robot Scavenger hunt. Each child took a list of robot parts to each one of four robots. They searched for the parts on each robot and checked them off. At each robot, a student explained how the robot was build and what the robot was designed to do. We then gave a demo of the robots. The kids were very attentive and loved seeing Shark Byte shoot off the basketballs. After the demo, some of the kids got a change to drive the robots. Thanks for your support of the McDevitt’s robots team. Next up for the team is a LabView programming class we will be hosting in August. Brendan Burke : Mentor Team 3974, E=mCD from Bishop McDevitt H. S.